The Corn Store is the perfect retreat all year round in a quiet rural hamlet, perfectly located for exploring the unspoilt coastlines of North Cornwall and Devon. This well thought out new first floor conversion combines original features with contemporary design. Treat yourself to breakfast on the balcony, enjoy the walk-in shower, curl up in front of the wood burner, or try out some stunning coastal walks. This light and spacious double bed apartment has been completed to a very high standard, offering guests a home from home experience. Its attractive Victorian stone exterior and spacious balcony give it pride of place in our courtyard, with parking directly outside. The other buildings beneath and adjacent to the Corn Store contain a guest Utility area, an area for storing tools, and a wood store. To the far left of the courtyard is a ground-floor barn conversion for guests, which has its own entrance and parking area around the back, and is therefore completely separate from the Corn Store. We’re passionate about this area and want to share it with our guests. We provide a wealth of information covering local attractions, our favourite walks set out on a local Ordnance Survey map, recommended places to eat, and tourist information covering Devon and Cornwall. With our insider knowledge you can discover places that only the locals know about. The Corn Store is four miles from the coast and local amenities, and 15 minutes’ drive from Bude, voted best UK seaside resort. The interior is all about comfort. The en-suite shower room has underfloor heating and a generous walk-in shower. The large open plan living area has a fully equipped fitted kitchen with dishwasher, and seating area with cozy wood-burning stove, and 43” smart TV. In addition there’s a separate utility area close by with washing machine and dryer, and additional freezer space if you need it. Bask in the morning sun on the large balcony or enjoy fabulous views over the Marsland valley from the indoor mezzanine level. This is a good vantage point to follow the antics of the wild rabbits who colonise our back lawn and out-manoeuvre our two cats. And sometimes you’ll see a local farmer’s cattle in our field, or wild deer in the valley. Guests must be mobile enough to negotiate a flight of steps up to the front door, and will need a car to get around. Guests are welcome to enjoy our garden, and can borrow sun loungers and beach equipment that we keep in the guest utility room. We provide our guests with a selection of towels, pressed bed linen, cleaning materials, washing tablets & conditioner, and tea/coffee/sugar. There are a selection of DVDs, books and games for guests to enjoy. You’ll find our farm easily from the Atlantic Highway (A39), nestled in the peaceful, rural hamlet of Woolley, 9 miles north of Bude. Although we’re no longer a working farm you’ll be able to see either cows or bullocks on our 13 acre field for most of the year. The Corn Store is the perfect base for exploring North Cornwall and Devon. There’s something for everyone. Walkers, photographers, and surfers can enjoy a spectacular stretch of coastline all year round. Nature lovers have the unique Marsland Nature Reserve on their doorstep. Stargazers can benefit from the dark skies, and holidaymakers are spoilt for choice between rocky or sandy beaches, and a huge variety of outdoor activities and places to visit. When we unexpectedly found ourselves without jobs after many years of commuting to London we decided to do something completely different - a real lifestyle change. So we bought our dream home in North Cornwall and haven't looked back. Our 5 children are independent and still live in SW London. Between us we are proud grandparents to 10 grandchildren. We have two surrogate babies, brothers Bubble and Squeak, who we rescued from Cats Protection. We're both keen photographers and walkers - both of which go very much hand in hand here. We both worked in London for many years, working for a global publishing company. Riki now works as a care worker in a residential home, whilst Martin maintains and improves the farmhouse, its buildings and land. Our aim is that guests thoroughly enjoy the Corn Store, its location, and the surrounding area. We knew instantly that this was the home for us - it's a truly magical, undiscovered spot. It offers the best of everything -we're in a quiet rural hamlet and yet you can get to the Atlantic Highway (A39) quickly, which links North Devon to South Cornwall. So we're easy to find. Woolley is a very friendly community and made us feel very welcome from the start. Creating this conversion has been a labour of love and we're very proud of the result. It complements our courtyard. We have worked tirelessly to improve the fabric of our farmhouse and all its buildings - a bit like painting the Forth Bridge .... but I'm sure we'll get there in the end! You can park outside the Corn Store, and enjoy breakfast on the balcony in the morning sun. Or chill out on the indoor mezzanine and admire the wonderful views of the valley. Or curl up in front of the TV and woodburner watching a DVD. Indulge yourself with the walk-in shower and underfloor heating. Have fun creating moods with the lighting. Don't worry about how much luggage you bring - there's plenty of storage in the shower room, kitchen area, and cupboard space under the mezzanine. Really cosy and luxurious en-suite. The walk-in shower has a wireless digital soaker and hand-held shower. Underfloor heating and plenty of storage with fitted bathroom furniture. The Corn Store has excellent insulation . There's electric heating in the bedroom, the living area, and on the mezzanine. They're on a timer but guests can easily override this if they want. We've provided an all-seasons feather duvet of 9 and 4 togs so you can split or combine to suit. There are 2 pillows for each guest - one feather, and one synthetic to cater for different tastes. Housed in a separate guest utility area, shared with Barn & sometimes owner. Washing materials & conditioner provided. Guests can also use sun loungers and our beach equipment which we keep here. There's a tumble dryer in the guest utililty area. Shared with Barn & sometimes owner. Important to clear the filter after use. There's a parking space directly outside. Attractive sensor lights come on when it's dark. Due to limited broadband availability in this area we don’t recommend using devices for streaming. However wifi should support emailing and web browsing. Most mobiles have a good signal in our area. There's a free standing woodburner with curved glass, sitting on slate. We provide the materials you should need, so charge for additional supplies. Must use written instructions when lighting. There's a 2-seater sofa and armchair and bespoke oak stairs lead to funky seats on the mezzanine with its amazing view over the valley. Electric fan & 6-port USB charger. Fitted slimline dishwasher, perfect for two. We provide dishwasher tablets. There's an under-the-counter fitted fridge with freezer section at the top. However if guests would like more freezer space they can use a drawer in a tall freezer in the guest Utility room. Ceramic. There's also a cooker hood that extracts to the outside. Stylish crockery and dishes are provided. We aim to provide all the kitchen items you'll need to produce everyday meals. The kitchen area is in one corner of the open plan living area. The fitted units are stylish and complement the overall appearance. There are plenty of cupboards for all your food shopping. The dining area is next to the kitchen area. The oval oak table comfortably seats two people, but can be extended to seat four if entertaining friends/family in our other property, East Woolley Barn. There's a 43" smart LG TV with access to the internet. There's a DVD player with a selection of DVDs to suit all tastes. There are a selection of books to read. Guests are welcome to enjoy our gardens - large lawn to the front, secret lawn past the courtyard and rockery, and wonderful views over the valley round the back of our farmhouse. You're welcome to borrow any of our beach equipment which is in the guest Utility area if we're not using it. This is a first-floor conversion so isn't suitable for wheelchairs. Come here to de-stress, unwind and relax. It's such a peaceful location, with no motorways and dual carriage roads. Our hamlet is close to the Atlantic Highway (which connects north to south) so you can always find your way here easily. The SW coast path offers so much to walkers of all abilities - we can advise you and provide useful maps and guidebooks. We have so many lovely walks close by. Our stream is the border between North Cornwall and North Devon. Drive north and discover historic Hartland, Clovelly, Appledore, and Exmoor. Drive south and you'll come across Boscastle, Tintagel and Doc Martin's Port Isaac. If it's sandy beaches you love there's Sandymouth beach nearby, Westward Ho going north, and Summerleaze, Crooklets, and Widemouth Bay in Bude. And masses of other dramatic stony/rocky coves and beaches. As you'd expect there are many outdoor activities, such as surfing, paddle boarding, and kayaking. And there's also so much wildlife to enjoy. This is a really well presented, cosy apartment in beautiful countryside. We loved sitting looking at the view from the mezzanine. Riki and Martin were lovely hosts , the bread ,milk and eggs were very welcome. We were given lots of information about places to visit , some that we certainly would not have found by ourselves. We will return. Very comfortable and well equipped. We spent a glorious spring week at the Corn Store. Everything we needed was provided down to the finest detail. The property is very tastefully decorated and we thoroughly enjoyed staying there. There was a warm welcome from Riki and Martin. We found everything we needed and the underfloor heating in the bathroom and wine in the fridge were brilliant. The area provides wonderful walking in deep valleys carpeted with primroses and bluebells and spectacular cliff scenery. It is quite possible to walk directly from Woolley and short car journeys open up more possibilities, as does the bus from just down the lane. We can recommend the Corn Store without hesitation. 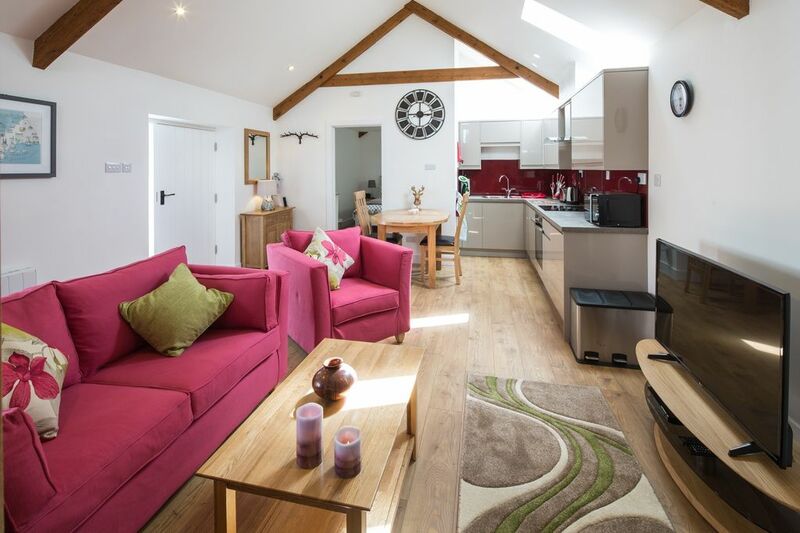 Lovely, beautifully converted barn conversion for 2. Excellent facilities immacutely clean with well thought out information pack. Comprehensive facilities with everything provided including a good welcome package of tea, coffee, bread, biscuits etc. Riki and Martin are lovely hosts and are helpful in making the most of your stay. The area has lots of attractions whatever the weather, but walking is probably the main one. The property was very clean - of a very high standard. All the appliances - shower etc was of very good standard. The owner was very welcoming and had a lot of information to share. The Corn Store is in the Cornish parish of Morwenstow, which has the most spectacular stretch of coastline - infamous for its many shipwrecks. We provide guests with an annotated Ordnance Survey map of our favourite local walks. So you can discover hidden gems that only the locals know about, in an unspoilt area of north Cornwall/Devon. In Morwenstow you'll also find the 13th century Bush Inn, and Rectory Tea Rooms, both steeped in history. A short walk away you'll stumble across Hawkers Hut on the cliff edge, the National Trust's smallest property. Welcombe Mouth Beach is just 14 minutes, drive with its spectacular rock formations. And Sandymouth is our nearest sandy beach 15 minutes' drive away. There are many other sandy beaches and rocky coves to explore. It takes only 5 minutes to reach Kilkhampton, our nearest village, which boasts an excellent small Co-Op, Post Office, two pubs, Chinese takeaway and chippie with cafe. Our local pubs are The Smithy in Welcombe, and the Bush Inn in Morwenstow, both offering food, and about 10 minutes' drive away. The nearest town is Bude, 20 minutes' drive away, with Morrisons, Lidl, B&M, and an eclectic mix of independent shops, Sea Pool and two sandy beaches. Enjoy a cocktail at the Beach Hotel overlooking the sea, or brave a dip in the sea pool. We're always updating the places that our guests have enjoyed visiting. Use these recommendations to kick-start your holiday plans. Use of a car/car hire is essential. The nearest village with food stores, cafe, Chinese takeaway, is Kilkhampton, 4 miles down the A39. Hartland Quay and Abbey are 15 minutes' drive. Bodmin, Dartmoor, and Exmoor are all 1 hour's drive away.